Your tax-deductible donation helps to enhance BCFL’s programs and services and provides long-term, stable support to help BCFL meet the evolving needs and interests of our community. Visit our convenient, secure online donation page to make a gift today. Online: Make a Gift Today! By mail: Send your check payable to “Bucks County Free Library” at 150 South Pine Street, Doylestown, PA 18901. Securities & Donor-Advised Funds: Making a gift of stock or other securities, or a charitable grant from a donor-advised fund, offers you the opportunity to make a financial contribution while also realizing many important benefits to yourself. Please contact Michelle Wexler, Development Director, at wexlerm@buckslib.org or 215.348.0332 x1115 to learn more. You can enhance your contribution to BCFL if your employer offers a corporate matching gift program. Check with your Human Resources Department to ensure that you include the necessary paperwork with your gift. Corporations that match gifts are recognized in our Annual Report, and donors receive recognition for their total contribution. Create your own legacy by joining a special group of individuals who have made BCFL a part of their estate plans. Planned gifts enable you to create meaningful gifts to enhance BCFL while also meeting your financial planning needs and objectives. Establish a charitable trust or life income gift benefiting BCFL. If you are interested in making a planned gift, please contact Michelle Wexler, Development Director, at wexlerm@buckslib.org or 215.348.0332 x1115 to learn more. Donors who make planned gifts are inducted into BCFL’s Legacy Society and receive recognition in our Annual Report. Contributions to BCFL can be made in memory or honor of a loved one, friend or colleague, or to commemorate a special occasion. All tribute gifts are used to procure new materials to benefit the Bucks County community. Tribute gifts can be made online using our secure online donation page: www.buckslib.org/donate. To make a tribute gift by mail, please enclose a completed Tribute Gift Form and send your check, payable to Bucks County Free Library, to 150 South Pine Street, Doylestown, PA 18901. Research consistently shows that communities with active library systems enjoy a stronger economic climate. As a local business, your financial support will help BCFL to continue to provide valued, in-demand programs and services free to the Bucks County community – making our community smarter, happier and stronger. Gifts can be made online by selecting “Make this gift on behalf of an organization” on our secure online donation page: www.buckslib.org/donate. Or, to make a gift by mail, please send your check, payable to Bucks County Free Library, to 150 South Pine Street, Doylestown, PA 18901. BCFL is recognized as an Educational Improvement Organization by the Commonwealth of Pennsylvania’s Educational Improvement Tax Credit (EITC) program. 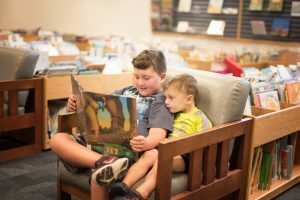 BCFL hosts a variety of youth literacy programs throughout the county, including Summer Quest and the Summer Reading Challenge, that are eligible to receive corporate EITC tax-credit contributions. A one-year commitment to BCFL can earn your company a tax credit equal to 75% of your contribution, and a two-year commitment of the same amount can earn you a 90% credit for two consecutive tax years. EITC donors receive special recognition in our Annual Report and in all media pertaining to EITC-supported programs. Contact Michelle Wexler, Development Director, at wexlerm@buckslib.org or 215.348.0332 x1115, to learn more about BCFL’s funding priorities, EITC status and opportunities for support and sponsorship.